The first cameraphones were little more than a gimmick, then we wanted quality. Then it seemed quality was put on hold in order that we could share out images far and wide. We are now starting to see phones being built into cameras and not the other way round. What I mean is that some phones like the N86 have cameras so good I feel the time has arrived where we are getting phones more than capable of providing a high quality image and equipped with the hardware to share wherever/whenever we want. I had a Nokia N86 on trial for a little while recently to beta test a new app made by Carl Zeiss that was aimed at helping you get the most from your mobile phone photography. It reminded me of a few tips I posted online when I got my first decent camera phone, a Sony Ericsson K750i. This was the first phone that made me think we were getting somewhere and that I would be able to take ‘decent’ photos. Now we have ‘Social Media’ It appears less about perceived quality and more about immediacy and reach. Still there is no reason why we should not have it all. Photo tips for camera phones. Use the best resolution available – Why anyone would want to take low resolution picture on an already limited format is beyond me. Memory is getting really cheep right now so stick the biggest card your camera phone will take and keep the quality setting on maximum to get the best resolution/image size. NB: Most cameras will automatically resize for texting & emailing so don’t worry about sending large files..
Don’t use effects – There is nothing you can do in the camera that you could not do later on the computer or within a phone app. If you want a picture to be in Black and white.. Wait and do it later so at least you have a backup copy of the original colour pic. Again, its easy to convert from colour to black and white but you try to do it the other way round! Fill the frame – Don’t be afraid of getting in really close. If you haven’t got a lot of resolution to play with you don’t want a little pixel of a person standing in the distance. Fill the view finder, get in as close as your focus will allow and you will get much better detail in your photos. Avoid using digital Zoom – If you have a zoom feature on your camera phone it will most likely be a digital zoom. All this does is cut into the amount of pixels you have to take the picture with, rapidly reducing the quality of your final image. Use your legs where possible and just move in close. Where not possible, later on the computer, crop in a little. Be snap happy – You don’t have to worry about the cost of film so let rip. Take as many pix as your memory card will allow and you will be more likely to capture that perfect moment. Play around, experiment. Some camera phones have a ‘best shot’ setting, taking a number of pix when you press the button and allowing you a choice from similar moments. Break the rules! – Once you find that the basic composition rules (like the rule of thirds) gets you pretty pictures.. Break them! Some of my favorite shots happened when I was shooting from the hip or through an object or from a strange angle. Try to get different perspectives from the norm to create an interesting picture. 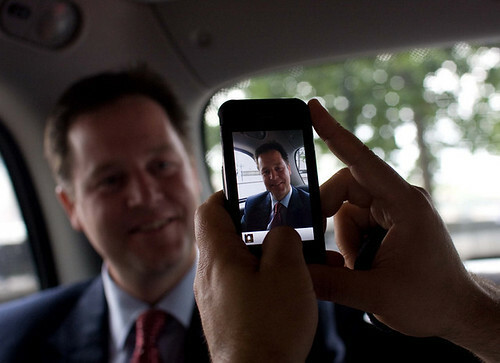 ..and finally, Be prepared – Having your camera phone with you is one thing, remembering how it can be used is another. Practice using every aspect of it from the macro (close-up) feature to switching the flash off and on manually. Once this is all because second nature you are ready to grab that one shot you may be able to retire on. That is a great list of tips and I’m glad you have taken the time to share them. I must admit that my attempts of taken pictures with my iPhone have been mixed but not to your standard. I will now try and put your advice to practice. Thanks again.